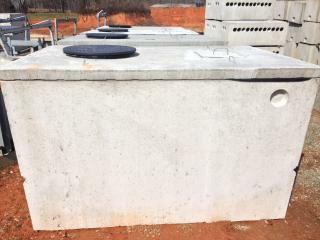 Pump Tanks are designed to be utilized where a normal gravity system will not work and in conjunction with a septic tank and effluent pump. 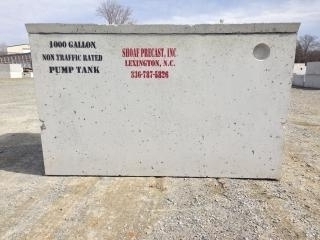 Shoaf Precast produces One Piece (Top Seam) and Two Piece (Mid Seam) pump tanks, available in sizes from 240 Gallons to 3,500 Gallons in Non-Traffic applications. 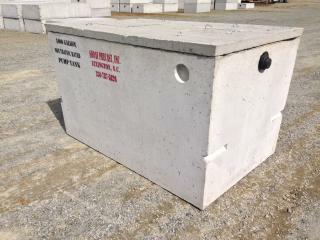 All pump tanks can be fitted with concrete or plastic risers and are stocked for same day delievery. 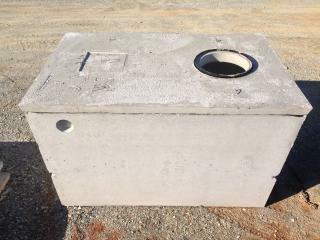 We can also cast in Orenco adapters in which are used for AdvanTex Pretreatment Systems. 1,250 Gal. PT-42 8,500 10 ft. 5 ft. 66" 52"
1,500 Gal. PT-280 11,500 13 ft. 7 ft. 61" 47"
1,800 Gal. PT-128 12,000 13 ft. 7 ft. 70" 56"
2,000 Gal. PT-125 16,000 15 ft. 8 ft. 68" 55"
2,500 Gal. PT-125 16,000 15 ft. 8 ft. 68" 55"
3,000 Gal. PT-193 20,000 15 ft. 8 ft. 82" 66"
3,500 Gal. PT-193 20,000 15 ft. 8 ft. 82" 66"
1000 Gal. PT-363 8,000 10 ft. 6 ft. 60" 46"
1275 Gal. PT-306 10,500 10 ft. 6 ft. 67" 55"
1500 Gal. PT-353 11,000 13 ft. 7 ft. 62" 48"
1775 Gal. PT-352 13,000 13 ft. 7 ft. 71" 57"